We are delighted to announce we will be offering the Hoopsisters Embroidablock program that will allow you to make perfectly quilted, pieced, and decoratively stitched quilt blocks all in the hoop of an embroidery machine. There are two options this year. 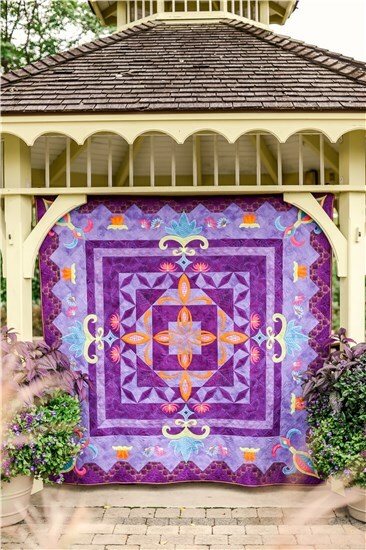 We are again offering the Sisterhood quilt that was so popular last year as well as the new quilt Fleur de Lis. Sisterhood incorporates the beautiful Celtic knot image in two colors. The quilting is stunning, and the stitch out times are very manageable. You will learn the stitch and trim technique for machine applique in the hoop as well as other new in the hoop techniques. Fleur de Lis is the newest Embroidablock that features the elegant and timeless fleur de lis motif. You will learn the stitch and trim technique for machine applique in the hoop as well as other new in the hoop techniques. We will meet the second Saturday of the month for a demonstration of techniques for the blocks. This a lecture/demo format; no actual sewing will be done during the class. This could change, but most of the students prefer this format as they do not want to bring their machine to class since they tend to be heavy. However, for new students we do recommend that you bring your embroidery machine to the first class so you can practice making a block with instruction so you are comfortable with the technique before you go home to make the rest of your blocks. When you sign up for this class, you are committing to the monthly fee for the duration of the program. All students are expected to make every effort to attend the monthly class as this is a Hoopsisters requirement for my store license. Whether you have been quilting all your life or you are just beginning, we know you will enjoy the experience. We encourage you to laugh, have fun, and get to know your fellow HoopSister /Mister. All brands of embroidery machines are welcome, but you must be familiar with your machine's embroidery functionality. Blocks sizes: 5" - 9"; the bigger the block, the bigger your quilt!